According to yogic philosophy, we are alive because the cosmic energy from the Universe flows into our body through the breath, which is the life energy force or “prana.” The very essence of our life is breathing. Whenever we get stressed or experience negative emotions our breathing becomes irregular and shallow, thus affecting the flow of prana in our body. Laughter helps reverse that process. Kapalbhati is a famous yogic exercise that entails contraction of the throat and palate muscles and entails a jerky and rhythmic movement of the diaphragm to expel air in a series of bursts. This is precisely the foundation of the HO-HO, HA-HA-HA exercise between each laughter exercises. 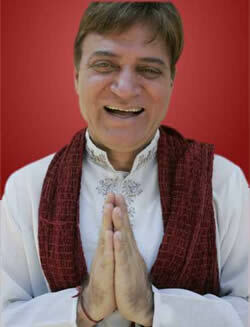 Bhastrika and Swash Shuddhi are similar yogic exercises used to clean the respiratory passages in forceful jerks of breathing and the rhythmic contraction of lung and throat muscles – the very same muscles and actions used in Laughter Yoga during the HO-HO HA-HA-HA exercise and other playful laughter. Talasana is the yogic stretching of arms and exercising the neck and shoulders while taking a deep breath. Simha mudra is the famous lion laughter of Laughter Yoga, which entails keeping the eyes wide open, fully extending the tongue, and roaring like a lion. We encourage you to explore http://www.divyayoga.com/yoga-a-pranayam-videos.html. Patanjali Yogpeeth (one of the largest Yoga institutes in India) offers hours of free videos of Yoga Asanas & Pranayama exercises on this website. Yoga is the science of right living and, as such, is intended to be incorporated in daily life. It works on all aspects of the person: the physical, vital, mental, emotional, psychic and spiritual. The word yoga means “unity” or “oneness” and is derived from the Sanskrit word yuj which means “to join.” It is a means of balancing and harmonizing the body, mind and emotions. It includes many mental and physical disciplines. The most popular of these disciplines in the Western world is Hatha Yoga, an approach concerned with balancing the energies through body postures (asanas). Hatha Yoga is primarily a solitary practice with no group interactions. Bhakti Yoga is the spiritual practice of fostering loving devotion (bhakti) to a personal form of God. 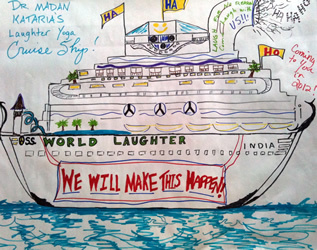 This entry was posted in Sebastien Gendry's Laughter Yoga Blog and tagged Kapalbhati, kataria, laugh, laughter, laughter yoga, laughteryoga, Pranayahahama, pranayama, yogic breathing on May 22, 2012 by Sebastien Gendry. The origins of India’s well known laughing clubs is revealed in this documentary, one of the first produced on the subject. Interviews with laughter club founder Dr. Kataria and fellow laughing club members shows the significant impact laughter has on the spirit and health in India and throughout the world. This entry was posted in Laughter News and tagged club founder, club members, kataria, laughing club, laughing clubs, laughter club, laughter yoga, significant impact on March 23, 2011 by Sebastien Gendry. National Public Radio aired a nice piece on Laughter Yoga yesterday. The conclusion: “Even if the science remains controversial, I will try some of Dr. Kataria’s exercises. Apart from the occasional stomach cramp, it surely can’t hurt 🙂“. Read the transcript of this broadcast here. This entry was posted in Laughter News and tagged kataria, laughter yoga, national public radio on February 3, 2011 by Sebastien Gendry. This entry was posted in Sebastien Gendry's Laughter Yoga Blog and tagged anxiety, ego, emotions, enactment, inner feelings, judgments, kataria, laughter clubs, laughter yoga, mental phenomenon, motivation, participant, performance actors, performance health, physical act, reply, sense of humor, thought processes, yoga practitioners, yoga sessions on July 2, 2010 by Sebastien Gendry. This entry was posted in Laughter News and tagged kataria, laughter yoga, SAB TV on February 23, 2010 by Sebastien Gendry. By Maj Britt (Denmark). I’m a fitness trainer and joined my local laughter club because I thought it would be good for my immune system. I later realized however that I have gained far more than just better health. I can feel my soul healing. I’ve opened up and this practice has helped me know myself better. 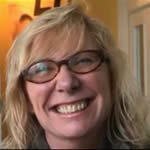 Maj Britt (Denmark): Laughter Yoga has helped me gain far more than just better health. I can feel my soul healing. I was a very serious person and was not good at playing. It’s very different now! The most beautiful thing about laughter is that you can make mistakes. I come from a family where no one is supposed to make any mistakes. It is such a relief to know that one can make a mistake and it’s OK.
Laughter Yoga has also helped me heal from an important rejection by someone I loved. We had a lot of problems and then suddenly he left without saying goodbye. I was very sad and then I remembered what Dr Kataria had told me, to simply say “So What?”. After I said that I started crying and ended up laughing. I could see how ridiculous the whole thing was and I felt much better. I feel I can do anything in the Universe. I know that when I’m feeling low and depressed I can laugh and that it will help me lighten up become my happy self again. This entry was posted in Inspiring Testimonials and tagged beautiful thing, better health, fitness trainer, kataria, laughter club, laughter yoga, soul healing on February 8, 2010 by Sebastien Gendry.